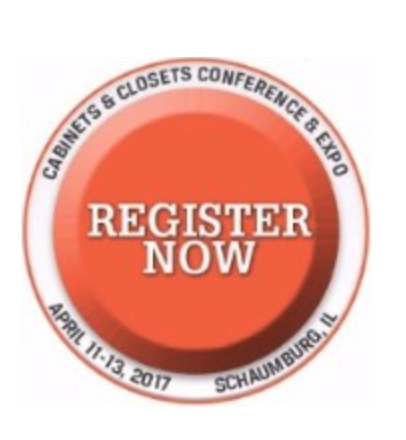 Plus Closets will Exhibit at the 2017 Cabinets and Closets Coference and Expo in Greater Chicago (CCCE), Booth 119. Visit us at booth 119 at the Cabinets and Closets Conference & Expo, Apr. 11 - 13 2017, Renaissance Schaumburg Convention Center, Schaumburg Illinois. Register for Your FREE Expo Pass or $50 off a Cabinets and Closets Conference Pass courtesy of Plus Closets. APRIL 12: EXPO FLOOR OPEN 10:00 a.m. - 5:00 p.m.
APRIL 13: EXPO FLOOR OPEN 10:00 a.m. - 3:00 p.m.
Free Expo Hall pass from Plus Closets (code ClosetPro17) or $50 off a Cabinets and Closets Conference Pass (code VIPCONF)!